Francine has a relative living nearby. She had arranged that we visit her at about 2:30 this afternoon. Before then, though, we were free to use a sunny morning for some fun and games. The nice thing about a wildlife hobby such as Odonata spotting is that it provides a ready excuse for cycling and/or walking somewhere. We decided to combine both modes of transport to visit another likely haunt from the New Forest Dragonflies website. I’d programmed the location into my Garmin eTrex GPS device so we were able to home in on it quite successfully, first à bicyclette and finishing through a wooded part of the forest à pied. We found a small stream that had quite a bit of activity though all of it was down to Common Darters (Sympetrum striolatum). I snapped a few for the record and failed to catch a tandem pair ovipositing. One day I’ll get them. We bumped in to another enthusiast armed with camera and bag of mushrooms that he’d gathered. 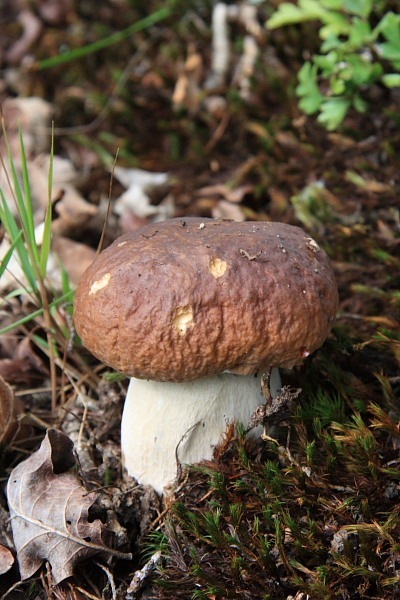 Not only was his bag full of ceps (Boletus edulis), yummy and highly prized gourmet mushrooms, but his camera was a Canon EOS 7D (drool, drool). He was clearly a man of considerable taste and began giving us a brief lesson on the local fungi. Having grabbed a shot of a precious cep (which we left to spore) and enthused, no doubt, from the brief introduction of our new found acquaintance, Francine began snapping several other fungi. The one on the left demonstrates how careful it is necessary to be; it looks very pleasant and completely appetizing but it’s called the Death Cap. In this case, there’s a clue in the name – causes liver and kidney failure, apparently. 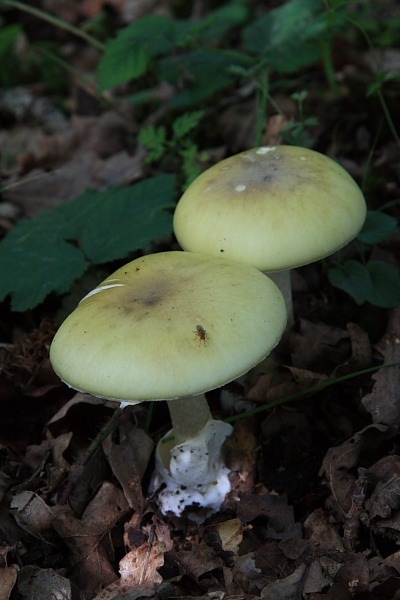 The name is not always a clue, though; there’s another fungus called Plums and Custard (Tricholomopsis rutilans) ‘cos of its colour which is inedible. 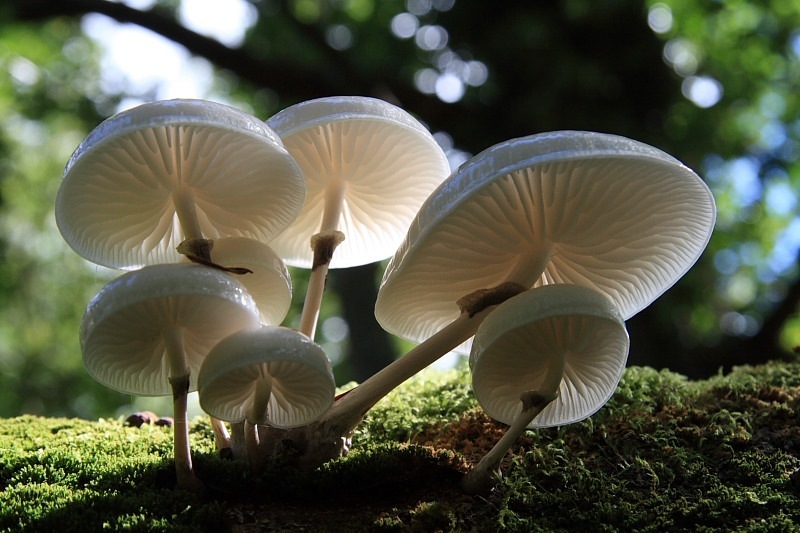 On the right is the so-called Porcelain Mushroom (Oudemansiella mucida) which was growing, as they do, on a Beech trunk fallen across a gap offering Francine this great shot from underneath. Meanwhile, I had begun wandering back slowly and spotted a hawker hawking about. These guys are frustratingly restless so I muttered a silent prayer to the God of nature photography and pleaded with it personally to settle and give me a chance of a shot. To my complete surprise, it did exactly that. It came to rest hanging quite low in a bush. I was so stunned that I nearly didn’t react. Fortunately I came to my senses in time to rattle off a couple of shots. (Don’t tell Francine I was lying on the ground in clean clothes.) 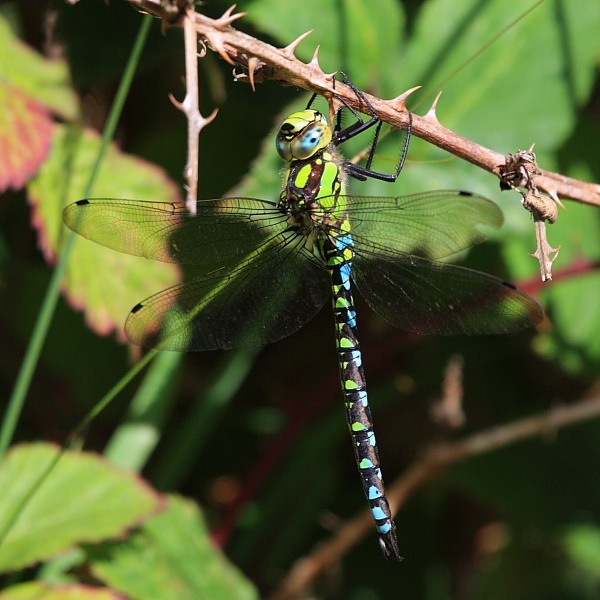 ‘T was a magnificent male Southern Hawker (Aeshna cyanea) to partner my ovipositing female Southern Hawker from yesterday. Happy camper! Francine’s relative may have been close but she was on the other side of Beaulieu. Unfortunately this is the weekend of the annual Beaulieu autojumble event. Going was no problem but returning after a very pleasant visit through Beaulieu made us run smack bang into the masses of autojumble sellers and buyers, all of whom were spilling out filling the few, narrow, surrounding New Forest roads.